Halloween is less than a month away now — and so, you want to dress like your favorite character from The Twilight Saga. Here is Novel Novice Twilight’s Halloween Costume Guide. Bella is no girly-girl, but any fan knows she has a few different looks. The most common is her everyday wear: jeans, topped with t-shirts and flannel shirts, hoodies or jackets. Her usual footwear? A good pair of Chuck Taylor sneakers. We’ve also seen Bella dressed up. Her prom dress in Twilight was a knee-length, blue dress — layered with grey capri leggings and an embroidered cardigan sweater. In New Moon, she’s seen wearing a flocked green taffetta party dress for her birthday. Hot Topic has just started selling Bella’s Birthday Party Dress — add a pair of Chucks, and you’ll look just like Bella at her doomed birthday party in the New Moon movie. Hot Topic is also now selling Bella’s courderoy jacket and Bella’s Cullen crest ring (apparently, a prop replica from the movie). Arguably, the best accessory might be Edward Cullen himself, but one of the hottest, must-have items from Twilight has been Bella’s stylish, wear-it-with-anything jacket. This versatile little number’s slim fit, pockets galore, roomy hood (perfect for the rainy Pacific Northwest! 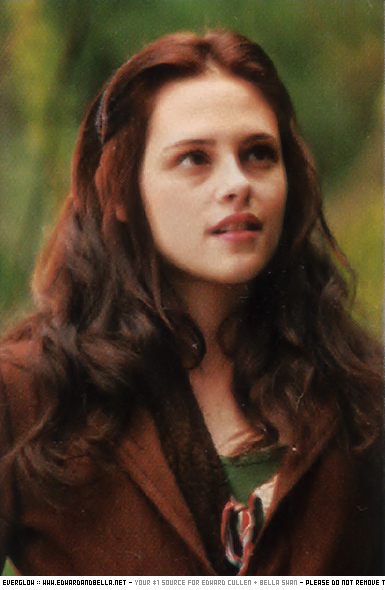 ), and delightful blue shade allow Bella to blend splendidly with the Cullens’ cool palette. To truly copy Bella’s overall Twilight look, keep clothes slim-fitting and latch onto layered tops, but don’t be afraid to get a little romantic with a whimsical piece of jewelry or boho blouse with floral embroidery. Laid-back and comfortable seems to be Bella’s demand, and even in the New Moon party scene she’s sporting a forest green dress with her typical boat shoes – showing that pairing dressy with casual is truly a look that never goes out of fashion. Bella trends: layered tops; headbands; mixing fancy with a little bit of grunge. Bella’s hair is usually down — in loose waves. Sometimes she wears it with a headband, or pulled into a loose ponytail. Edward’s look is all about pressed button-down shirts, tailored jeans or trousers, and stylish jackets — like that distinct grey peacoat from Twilight. 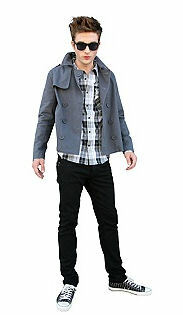 This year, Hot Topic is making it easy — having put together the entire Edward Cullen look, complete with grey peacoat. Edward also wears his Cullen crest wristband in both movies, and Hot Topic is now selling an Edward Masen ring as an authentic movie prop for New Moon. We’re not sure yet how that figures into the movie … but we can’t wait to see. Can you? If you really want to be authentic, you could even invest in some golden contact lenses (or red for bad vamps, or black for hungry vamps). Just be warned, custom contact lenses can get very pricey. For the brave guy — slap on a little shimmer powder, for that authentic sparkly vampire look. And of course, don’t forget those smexy Ray Ban sunglasses Edward sports in select scenes from the movie. Volvo accessory is optional. In Twilight, Alice was known for her bohemian, vintage looks with fitted vests, lace sweaters, and turquoise jewelry, all staying on the white and gray spectrum. But she was definitely a style maven with her coveted Diane von Furstenberg Oleada chiffon dress selling out promptly. Who could resist that antique look, particularly paired with her dainty ballet flats and leggings? 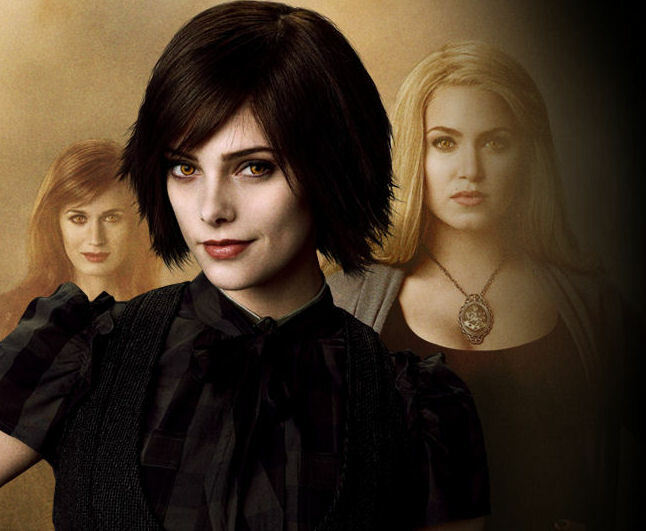 Rumor has it, New Moon will have Alice sporting even more high-end and polished fashion pieces. Glimpsing just a bit of her in the movie’s trailers, it’s a safe bet that gloves and scarves as head coverings might make a comeback in upcoming seasons. Alice trends: ballet flats; boho-chic dresses; never forgetting the importance of looking good. You can also purchase Alice’s Cullen crest choker from Hot Topic. One word can define Rosalie – icy. This super-sharp dresser rocked a curvy body in skinny jeans with her fitted blazer, long scarves, and sky-high heels. Perhaps she’s the one who really started this whole boyfriend jacket and scarf craze! The New Moon clips haven’t revealed much of Rosalie yet except for the party scene, but even that one little glimpse shows she’s not slacking in the style area. She’s looking lean and mean in that LBD (little black dress) that is without a doubt not off the rack. Rosalie trends: boyfriend jackets; designer heels; red lips with anything. Esme’s hemlines are just below the knee, her skirts are high-waisted and belted, and her blouses are high-collared and frilly. It’s daytime glamour and nighttime elegance for this lady who sparkles even when not in the sunlight. 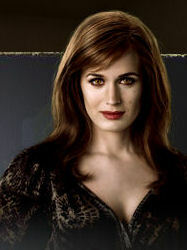 And Esme also adds a pop of color to the blue-gray-black-white color palette of the Cullens – purple. Grab yourself something eggplant or amethyst this fall and you’ll fit right in. Esme trends: pencil skirts; peep-toe heels; knowing that showing just a little skin is the sexiest look. TwilightPoison also has a guide to dressing like the ladies of Twilight from last year. The Cullens dress in lots of blues and greys, so look for those colors when putting together an outfit for Carlisle, Jasper or Emmett. For Carlisle, you could top a button-down shirt and tie with a doctor’s lab coat — or go for a high-colored jacket or sweater and scarf. 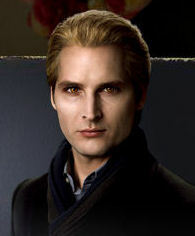 Peter Facinelli has said he wanted Carlisle to wear high-necked pieces as a sort of vampire security blanket — since his neck was bittne when he was turned. And remember, as the patriarch of the family — Carlisle will also be dressed the most conservatively. Look for classic, traditional pieces. Emmett is the sportiest of the Cullen men — but since he lives with Alice, he’s still going to be stylish. Emmett usually wears dark jeans and designer sneakers. Top it off with a well-fitted t-shirt or hoodie. The most essential part of a look for Jasper is a pair of cowboy boots — as an ever-present tie to Jasper’s Southern roots. Jasper also tends to dress in layers. Start with tailored slacks, then add a button-down shirt, topped off with a v-neck sweater and a military-style jacket. 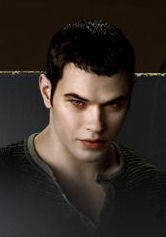 Becoming a Twilight or New Moon Vampire like Edward or any of the rest of Cullen clan is likely to be the chosen vampire look for tweens and teens. Creating a vampire costume for Halloween is fairly simple. Pick regular clothes to wear. Find or purchase a set of vampire teeth. Add white to very light face makeup to create a very pale complexion. Add sparkles or body glitter for Edward’s look. To really pull off the effect get black or golden contact lenses. For a True Blood or Vampire Diaries look, add some fake blood. Here’s another article for dressing like Twilight vampires, or check out last year’s guide for guys from TwilightPoison. A key element to the Wolf Pack costume is their distinguished tattoo (as spotted in promotion photos & posters for the New Moon movie). But where can you get a temporary version? Well, you can create your own! Start by saving our version of the tattoo (below) to your computer. Then print the image onto printable temporary tattoo paper. It’s as easy as that! 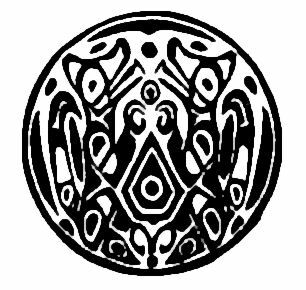 As for clothes, the wolves would wear a plain t-shirt or wife-beater (unless you’re brave enough to go shirtless) — or maybe snap up one of those Quileute baseball tees from Hot Topic, and some ripped/old jeans. And unless you want to go barefoot, lace up some ratty sneakers. Want to really indulge the evil side of yourself this Halloween? 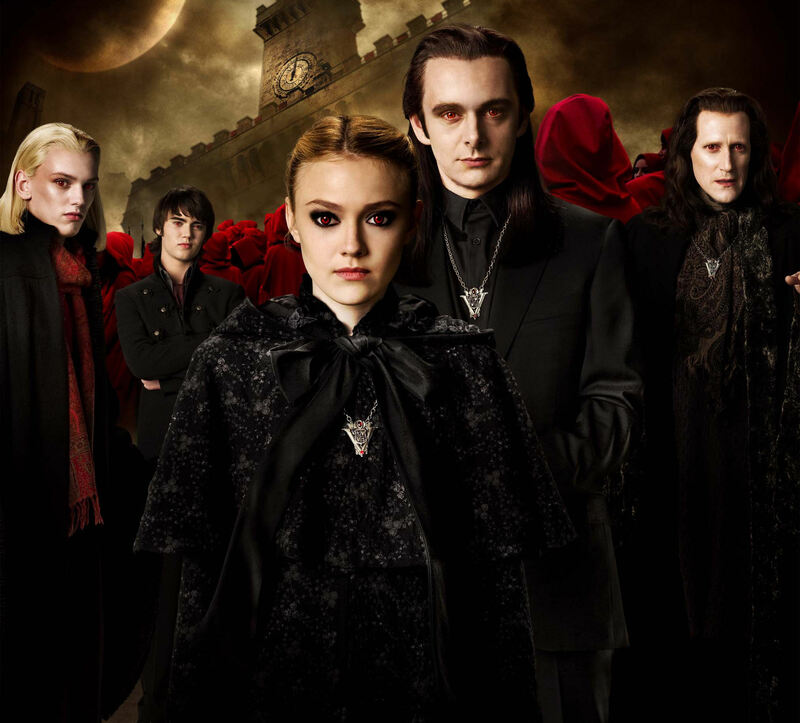 Then consider cloaking yourself in the garb of the Volturi – there are plenty of characters from which to choose! Guys (or daring ladies), go for Aro, and outfit yourself with a black, fitted suit with a buttoned-up black dress shirt underneath. A sleek black wig is also a must. Gals, get back in black with smirking Jane and wear some demure Mary Janes with just a slight chunky heel, some tights, a dress (preferably brocade or velvet), and a cape – all in black. A proper bun or chignon (in your blonde wig if you’re not a natural) is a must. And don’t forget the blood red lipstick and smoky eye makeup! If you’re going for one of the Volturi guard, a cloak is a must. Craft stores often offer patterns for a simple black cloak, or pick up a “generic” vampire costume and alter it to your needs. Male or female, your skin must be pale white, so be liberal with the powder, and you could even let others know you’ve recently snacked with a few dabs of “blood” near your mouth. A nice touch: see if you can round up an accessory that boldly displays the Volturi crest, be it a pendant, ring, or wristband (there might be something like that available come Halloween). You can buy the Volturi crest necklace at Hot Topic. Extra points: get your hands on some blazing red contacts! They’re not cheap, but what a statement! Sure, James met his gruesome end at the conclusion of Twilight (but really, he had it coming, didn’t he?) — but in New Moon, we still get to enjoy the other Nomadic vampires — Laurent and Victoria. Both have very distinct, and stylish looks — and their outfits can be pulled together easily with pieces from consignment shops or thrift stores. You could say Victoria embodies the natural look, with her to-die-for curls and barely-there makeup, she is the original flower child… with a lot more leather than lace to her rock ‘n’ roll attitude. Victoria trends: necklace upon necklace; statement tees; not being the list bit shy about showing her own personal style. For a really authentic look, style your hair in wild curls — then weave leaves into your hair, to embody the wild look Victoria has when she first emerges from the woods in Twilight. For Laurent, start with dark jeans or slacks — then add a ruffled shirt, topped with a jacket or vest. And of course, those signature dreds! If you don’t have the hair — check local costume shops for a good wig. NNT staff members Sara, Libby, & Stephanie contributed to this guide. 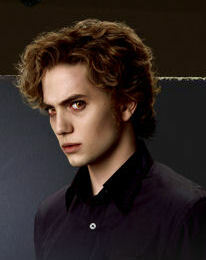 What are your Twilight Saga Halloween costume ideas? Share them in the comments! A roommate recommended me to check out this post, great post, interesting read… keep up the cool work! my name is bella to!!!! Love reading about anything to do with this topic, interesting post going to link back to it on my blog.